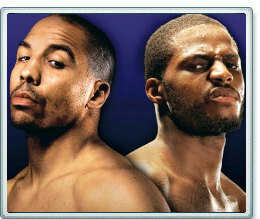 Andre “S.O.G.” Ward vs. “Bad” Chad Dawson: Who wins? By John J. Raspanti, DoghouseBoxing.com. On September 8 at the Oracle Arena in Oakland , Ca. WBC and WBA super middleweight champion Andre “S.O.G” Ward and WBC light heavyweight champion “Bad” Chad Dawson will settle their differences. Ward, 28, hasn’t been in the ring since he easily defeated Carl Froch last December. As the bell rang for the Froch fight, Ward (25-0, 13 KOs ) was keeping a secret. His left hand was hurting, courtesy of it bouncing off the noggin of one of his sparring partners. Ward dominated the early rounds with movement and sharp punching. Froch was a step slow. His punches caught only air. Ward was landing his left at will. Froch was staggered in round five. In round seven, Ward fractured a bone in his left hand. The pain was unbearable, but he soldiered on, eventually winning a unanimous decision. Dawson , 30, is a soft-spoken southpaw from Haven, Connecticut . He first won a title in 2005, when he stopped Ian Gardner. Back then, Dawson (31-1, 17 KOs ) was fighting in the super middleweight division. He defeated Tomaz Adamek in 2007 to capture the WBC light heavyweight crown. Dawson defended his crown six times until he ran into a more focused Jean Pascal in Montreal, Canada. His loss shocked Dawson , as well as most of the boxing world. Ward has a history of being an underdog. When he fought heavy-handed Edison Miranda, many thought his chin wouldn’t hold-up. Ward easily out boxed the overmatched Miranda. Super middleweight champion Mikell Kessler ventured to Oakland in 2009. His confidence was soaring. Kessler was the favorite to capture all the Super Six glory. There was no conceivable way he could lose to a guy with barely twenty fights. At least that’s what he thought. Kessler did lose. He never had a chance. Ward was sharper, slicker, and smarter. Dawson tangled with living legend Bernard Hopkins twice. The first time was at the Staples Center in Los Angeles . Dawson won the first round on points and the second on a throw down. Hopkins , in agony, claimed he couldn’t continue. The doctor agreed. The rematch took place last April at the Boardwalk Hall in Atlantic City . Dawson outworked Hopkins throughout the 12-round bout. Two judges had him winning nine of the twelve rounds. The third scored the fight a draw. Dawson had regained the light heavyweight title for the third time. In the ring after the bout, Dawson called out Ward. The challenge surprised many. The last time Dawson weighed 168-pounds was in 2006. The venue is a rocks throw from where Ward trains in Oakland. Here’s what I foresee happening on September 8. Dawson’s reach advantage will be an interesting challenge for Ward. Five inches is not something to sneeze at. Dawson will likely use his jab to keep Ward at bay. Ward will look to slip the jab and counter with his right. Dawson ’s trainer John Scully has said that the key to beating Ward is not letting him get comfortable. Ward’s intelligence and adaptability will kick in by round three. His right hand will find Dawson ’s chin. His ring generalship will be on display. As the fight progresses, Ward will continue to win the majority of rounds. Dawson, whose been accused of losing focus during fights, will hang tough and catch Ward occasionally. The action will pick-up as the fight enters the championship rounds. Ward’s strength and determination drive him to succeed. For two months, many have speculated that cutting weight will hurt Dawson during the fight. The last three rounds could determine if this speculation turns into a reality. If the opportunity presents itself, Ward might go for the stoppage. If not a win by unanimous decision looks like a safe bet.